Giuseppe Chiaramonte: You started studying guitar very early, at the age of six. How much do you think starting to play so young is helpful for a musician? How much important it was for you? Petra Polackova: I think it really depends on each person, everybody is different. I know some musicians who started to play an instrument later and after three years they were on the same level as those who had been playing already six years. It is also said that it´s never too late starting with some hobby or playing an instrument. However, starting playing an instrument early brings more experience, you live with the fact that playing an instrument is a part of your life, a part of your daily program and more things (I mean for example technical skills etc.) go automatically. At this young age you can already learn how to think “in music”, how to behave on a stage, how to work alone, how to resolve problems etc. I don´t think it is so important for me that I started so early, it is important that I started! Besides that, in the Czech Republic we might (and it is quiet common) start attending music school just as we start attending a basic school. G.C. : You got a perfect technique and your interpretations are extraordinarily expressive. Among the teachers you have attended lessons and master-classes with, who was the most important for your career? P.P. : I have met many interesting players and interpreters in my life, I was mostly inspired by their personalities than their musical ideas. Of course their musical ideas were also very important to me, but usually I looked on the person like on a whole complex of features, skills etc., what does he/she do, how he/she lives, plays, behaves, thinks of music, lives with the instrument, what can I learn or take from him/her. I think the most important experience for me was lessons with Nigel North because I like the way how he lives with the music and with the instrument and I like the incredibly huge tranquillity in everything he does. Besides that, I was mostly very impressed by Italian guitarists, for example G. Bandini, M. Felici, L. Micheli, S. Pallamidessi etc., because they knew a lot about theory and history of music and about guitar technique, all of them inspired me. However, my first lesson with Paolo Pegoraro was special, different… it was something that I can´t forget. Just as I came to the classroom I felt that he was the person with the way of thinking I was looking for. (Something similar can happen when you try new guitars, you can try twenty of them and then you get one about which you know that you want to play it for the rest of your life. (Something “magic”.) Since our first lesson, I had a big dream, a big wish to continue my studies in Italy with Paolo but I thought it is not possible for me. Well, after six years I know that if you really want something, you can get it. So I hope I will start my studies with Paolo Pegoraro in October in Graz. I would love to name some other people, who helped me a lot and I had great lessons with them: Z. Dukič, E. Papandreou, T. Müller-Pering, J. Perroy, P. Steidl, T. Offermann and P. Zaleski with whom I had first masterclasses at the beginning of my musical studies. A big thank belongs to my teachers. Bohuslav Faltus and Miroslava Pavelková were at the real beginning of my playing, they showed my “the way to music”. Zdeněk Dvořák was a kind of a spiritual teacher for me. Petr Saidl taught me how to think in music, listen to the music, work with colours, harmony and melody and thank to him I got to know many (not only guitar) interpreters so that I could learn how to find an inspiration also in other instruments. G.C: Your repertoire spans from Renaissance to contemporary classic music. Who is your favorite composer? P.P. : I think I really don´t have a favorite composer, I like music by Dowland, Weiss, Bach but also Legnani, Mertz or Brouwer. I love music by Chopin, Rachmaninov, Górecki, Schnittke, Pärt, Piazzolla, Falla or Albeniz too. The best music for me is that one which touches me the most, no matter by which composer and in which period was written. G.C. : In your concerts, do you use to play guitars of different epochs depending on the repertoire? Who is your favorite guitar maker? P.P. 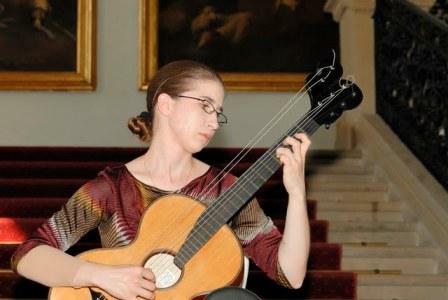 : In 2009 I bought an eight-string romantic guitar made by Jan Tuláček. It is a copy by N. Ries guitar (Wien, 1840). I use this guitar for renaissance, baroque, classical and romantic epochs. 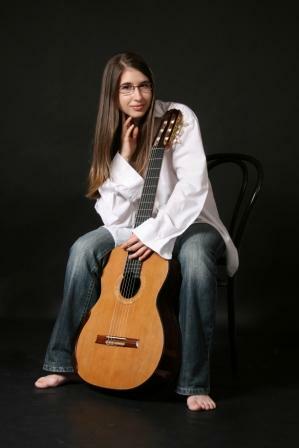 For others I use a modern guitar Concert Master Double Top made by Petr Matoušek. Both are Czech guitar makers, my favorite ones, I really like their work. G.C. : Please, tell us something about your role in Bohemian Guitar Orchestra. P.P. : Well, this is easy, I am just one of the players :-). Bohemia Guitar Orchestra (BGO) has about thirty members, I usually play the first or the second voice. I also played once a solo part in Piazzolla´s Concerto. Moreover, I take care of our web page http://www.bgo.cz and I helped with a recording engineering of BGO´s first CD. G.C. 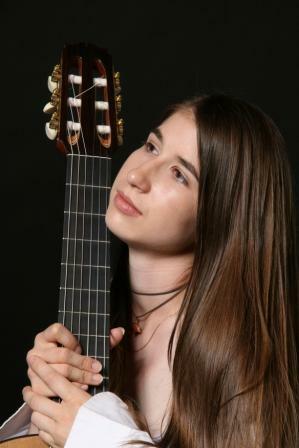 : You won some of the most important International Guitar Competitions. What is your advice for a young guitarist who is starting to take part in an important competition? P.P. : If it is possible try to choose a good repertoire in which you can show both your musicality and your technical skills. I prefer contrast pieces too, a slow and a fast one, or pieces from different epochs. I like to play not very known pieces, in my point of view it is better for the jury and also for the competitor. The jury has smaller chance to compare you with other players and is not fed up with hearing some pieces ten times or more. For example, the competition´s conditions say you to play some study, be sure that 90% of participants will play a study by H. Villa-Lobos, try to choose some other one, they are many of them and some are very beautiful. Prepare yourself for everything and prepare as well as possible. Try to get a lot of energy before the competition, some of them have more rounds and it can happen that you start to lose energy and concentration after each round. My final advice is – don´t forget to be yourself! G.C. : When and where are you going to perform your next concert? P.P. : My next concert will be in Kutná Hora in the Czech Republic at “The guitar night”. Guitar duo Patrick Vacík & Matěj Freml, Rolf Lislevand and Wolfgang Muthspiel will play there too. G.C. : What do you use to do before a concert? I mean, do you prefer to stay alone with your guitar for warming up or do you prefer to speak/joke with friends… And the day before? Do you play a lot or like to rest? P.P. : The day before, I like to play a lot to prepare really everything. However, I usually travel to the place of the concert, so I try to work at least with the scores in the train to avoid memory problems during the concert. On the day of my concert I am not an outgoing person. I prefer staying alone concentrating only on me, guitar, concert, scores and music. I try to sleep long to get as much energy as possible. I need a lot of time to prepare myself psychically. G.C. : You visited Italy several times, you performed concerts in Italy and attended master-classes with Italian guitarists. You are also learning Italian! Musically speaking, what do you like of Italy and Italian musicians? P.P. : Ok, musically speaking, I think Italians have very good sense of building a melody line in music pieces. Maybe it comes from their “singing” language and from their history, too. Italy is a birthplace of the opera and the Italian guitarists I have met knew many opera arias by heart. For me it was a really interesting and uncommon experience to meet those people, at least because I do not know anybody in the Czech Republic who knows some plots of operas or even some texts of their arias. In my opinion we can learn a lot from Italians, especially about romantic period guitar repertoire and their authors inspired by operas. Italy seems to me to be a good country to find a great number of books about music, I have already seen there some important music books translated into the Italian language. This is some kind of Utopia for the Czech Republic, because we have even problems to find some simple books about music history. G.C. : Other than the guitar, what are your other interests? How do you like to spend your free time? P.P. : I like watching films, reading books, sleeping, cycling, learning languages, listening to music and I am interested in film music too. G.C. : Thank you so much Petra. I wish you all the best for your career! P.P. : Thank you very much!